The BluFX team are very proud to receive this award and to be recognized for their innovative and ground breaking remodelling of the proprietary trading concept. The BluFX solution has allowed a truly global talent pool of potential star traders to receive funding and access to the OTC (over-the-counter) FX market via a transparent and cost-effective fund allocation process. The company has invested in cutting edge trading technology utilizing a superior algorithmic risk matrix as well as assembling a team of market and risk professionals based in London to oversee the global enterprise. Outside the specialized quant based FX operation, today’s trading firms operate in the arenas of the exchange traded futures and OTC FX markets where proprietary trading has exploded since its inception in the 70s. These firms are typically formed by an ex institutional trader and funded by one main investor or backer, they employed individuals to trade on the firm’s behalf. 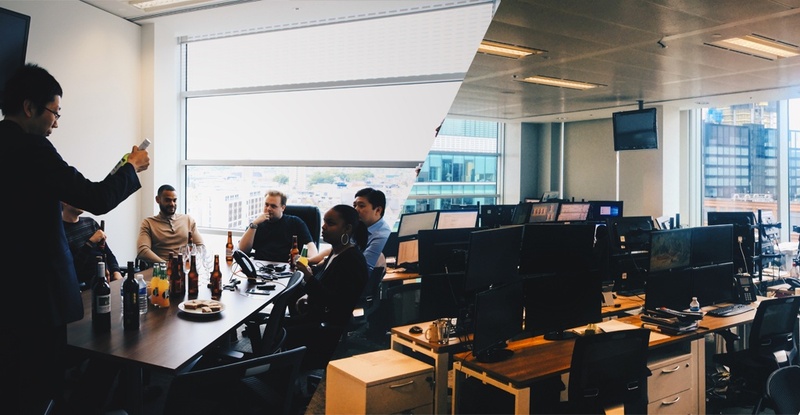 Today BluFX provides funding and trading facilities to a wide range of trading customer types, from near beginners to established fund managers and trading team leaders. By employing highly developed algorithms and data focused risk management models, ongoing investment in the latest technology has allowed its dedicated team of developers to manage systemic and event risk across global FX markets allowing a huge increase in the numbers of traders managed on its global platform. The investment in technology is not limited to the risk management and is evident in the efficiency of its communication platform used globally by its trader community. This technology allows all its traders to share trades, concepts, ideas and reports in real time across all national and time zone boundaries seamlessly. In this way, individual decision points, data, statistics and market information are turned into collective strengths and strategic advantages for the whole company. One of the greatest advantages offered by the BluFX solution over existing models is the transparency of the trader performance assessment, asset allocation and funding decisions. As BluFX end users come from a variety of backgrounds with the most common being graduates, ex bank dealers and committed retail customers seeking a more robust career it has been a challenge to develop technology that adapts to the common benefit. One of the areas that BluFX invests a lot of its resources into is in algorithm driven trader performance metrics and adaptive training techniques. BluFX customers generate vast amounts of useful behavioral financial data and the team are fully invested in mining this resource and presenting new ways of measuring and improving individual performance. Using its AI based market models, customers are guided towards more efficient asset allocation processes and implementation. The BluFX team is based in London and apart from the market and risk professionals is composed of social media, graphic, legal and HR experts. The trading and operational staff share an open-air campus style premises with hot desking facilities. There are regular open brainstorming sessions that allow the different parts of the company to contribute and devise holistic solutions that are seamlessly executed. The open and flexible nature of the management team allows the company to adapt to market events and economic drivers quickly. As the financial markets are in constant flux the companies multi layered risk matrix, although mostly automated requires high level input into its decision-making process. The flat management structure allows these decisions to be made on a 24hr basis and allows the algorythms to learn and adapt with each human intervention. As the financial market industry continues to expand into new areas and products such as cryptocurrency, the BluFX team introduce the technologies required to stay ahead of the game. For example the company recently made an expansion of its overnight currency swap facilitation into the blockchain arena. Cryptocurrency will now be a major part of the BluFX clearing process. The global nature of BluFX means that local regulation is a constant area that requires monitoring and maintenance with respect to systems and structures. The company employs legal experts in various jurisdictions that optimize the global model with local practices. The benefits are then passed along to customers in the form of directives and implementations. 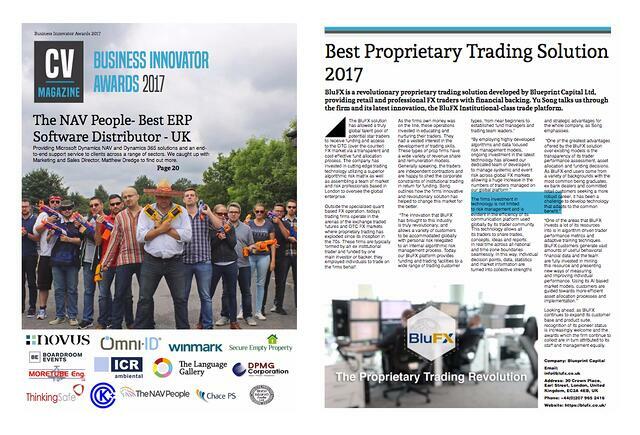 As BluFX continues to expand its customer base and product suite, recognition of its pioneer status is increasingly welcome and the awards earned on a global scale are in turn awarded to its staff and management equally. The Best Proprietary Trading Solution 2017 is a welcome addition to this tradition.